After many leaks in past few weeks, Samsung has officially unveiled the most high-end smartphone in the Galaxy A series in China, Samsung Galaxy A9 (SM-A9000). The Galaxy A9 features 6 inch Super AMOLED FHD 2.5D curved glass display protected with Gorilla Glass 4. The glass and metal design smartphone is just 7.4 mm thin and weighs 200 grams. It is powered by 64-bit Octa core (Quad core 1.8GHz Cortex A-72 + Quad core 1.2GHz Cortex-A53) Snapdragon 652 (MSM8976) with Adreno 510 GPU. The Galaxy A9 offers 32 GB internal storage with 3 GB RAM. There is microSD slot to expand storage up to 128 GB. The Galaxy A9 runs on Android 5.1.1 Lollipop and it also features Fingerprint scanner embedded in to the physical home button at the front and it also supports company’s Samsung Pay technology. For photography there is 13 megapixel autofocus rear camera with f/1.9 aperture and LED flash, and on front there is 8 megapixel camera featuring same aperture. It is a dual sim device with 4G LTE support. Other connectivity features include dual band WiFi, Bluetooth, GPS, NFC and micro USB 2.0 port. Large 6 inch device gets power from non removable 4000 mAh battery with Fast Charging technology and it should last for a day. 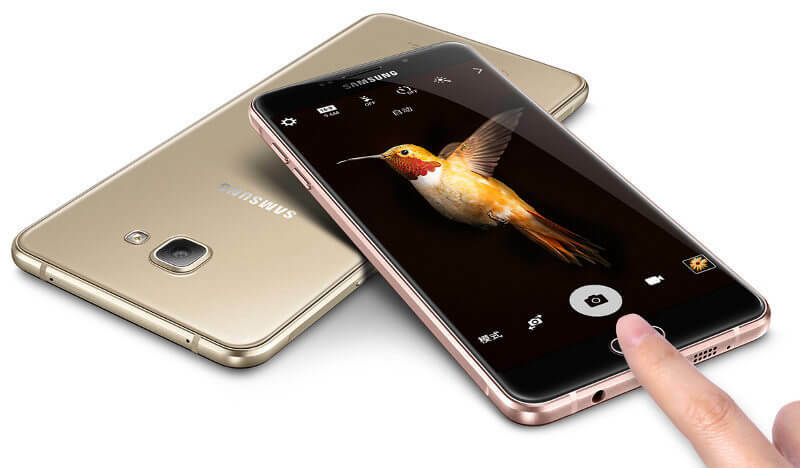 The Samsung Galaxy A9 is listed on Samsung China website and it will be available in Gold, Pink and White color from January 2016, pricing details are not yet revealed.